Our mothers always tell us to eat healthy and a variety of food, to get all the nutrition we need, well for pike this is not really the case. For most adult pike their main diet is fish and a lot of it. Though they do eat mainly fish they have been also known to consume other organisms, even birds. Pike are carnivorous and are known to eat other pike, fish smaller than it, frogs, crawfish, birds, and even small mammals. They have the ability to eat something that is one third of its size. To acquire prey pike have sharp teeth along with a complex skull and jaw structures that allow them to capture and swallow their prey whole. Researchers did a study of 491 pike in the River Frome using electrofishing to study what was contained within a pikes stomach. Out of all the contents of what was eaten 99% of it was fish and the other percent was made up of invertebrates. Some of the fish that pike feed on in the Frome River are Leuciscus leuciscus, Phoxinmus phoxinus (minnow), Gobio gobio (gudgeon), Salmo salar (salmon), Salmo trutta (trout), Thymallus thymallus (grayling), Cottus gobia (bullhead), and Esox lucius (northern pike). The study also found that at one year old pike can consume 41.53 kilograms per ha per year and at four years old 57.96 kilograms per ha per year. To see a pike in action check out this youtube video, http://www.youtube.com/watch?v=qMMcR-FGqeI&feature=related. 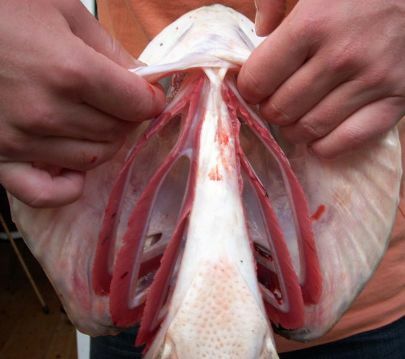 To exchange gases with the water northern pike use gills. 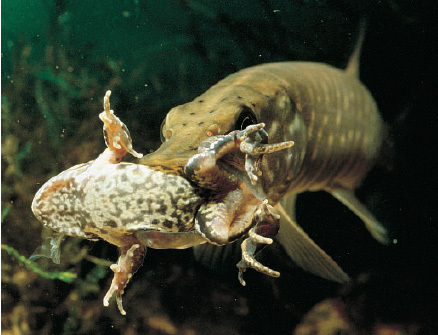 Once inside the body the pike uses a closed circulatory system to distribute nutrients and gases.